Deadly cold! Every year, Aussies in Japanese resorts get a few under their belt, and on the way home from the pub fall asleep in the snow and never wake up. The message here is don’t underestimate the conditions. Compared to Australia, conditions regularly hit -10, even -20, so the hoodie you wear outside at Thredbo, won’t cut in downtown Furano. Rug up! Image: a -23 degrees C day at Kiroro. It was cold! Although not as big as the avalanches in the Rockies or the Alps, avalanches can and do occur regularly in Japan, particularly after big snowfalls. More often than not, avalanches occur due to (warning – science content) a reduction in the ‘adhesiveness’ between layers of snow; for example, a layer of fresh dry snow on top of a layer of ice has very little adhesiveness, and tends to slide without warning. The colossal amount of snowfall in Japan increases this risk substantially. With the rise in popularity of off-piste skiing, the risks are even higher. So, although it’s very easy to get excited after a big snow fall, before you head into the back-country, or out through the gates, check the conditions (online) and/or consult with the local ski patrol. Irrespective of the conditions, always (a) tell someone where you’re going (b) never ride alone (c) and always carry beacons, shovels and probes (and know how to use them). Better still, employ a reputable guide. Sounds draconian, we know, but it may save your life. Warm fuzzies all round. Image: the Snowriders Aus crew equipped with beacons, shovels and probes, all while under the supervision of local guide Brian Findlay (of Niseko Academy). Aren’t we a bunch of goodie two shoes! With colossal amounts of snowfall comes lots of snowy, overcast conditions. It’s a trade-off we don’t mind. We’ll take powder over bluebird any day! So leave your sunglasses at home and invest in a pair of good quality yellow-lensed goggles. Good quality goggles should have dual lenses with an anti-fog coating on the inside lens. We find yellow or rose coloured lenses most suitable in low light conditions; mirrored finishes look good, but are not essential. Never wipe the inside of your goggles, no matter how tempting – it removes the anti-fog coating, and invariably end in tears. Good brands include, Smith, Carrera, Dragon and Oakley. We picked up these Dragon X1s at Mainpeak in Cottesloe for $260 (or $234 with our 10% discount). The X1 even comes with new ‘transition lens’ technology, meaning the tint changes with changing light conditions. Don’t skimp on goggles; if you can’t see, you can’t ride. Period. Image: a selection of good quality goggles. Dragon X1 (front); Oakley Wisdom (second and third from front (now out of production)) and a lower end, but still effective Dragon goggle (back). All are dual and yellow lensed. While there’s plenty of on-piste skiing in Japan, unless you’re are a first timer, the groomers are not where you’ll be. So leave your carving skis at home and invest in (or hire) a pair of mid-fat ‘all mountain’ (~85-95mm) or fats (>100mm). Having a wider ski under foot will help you ‘float’ over the fresh dry snow, and even ‘days old’ snow, which tends to be a bit heavier. Traditional carving skis (unless in the hands of an expert) tend to sink, making for heavy thigh destroying turns i.e. they’ll quickly wear you out. The same applies to snowboards; try and select a mid-flex set up with rocker and a little bit of binding set-back. Let’s not get any more technical than that…(that’s for another article). Image: a selection of skis in a Japanese drying room. Note the average width of the skis relative to the orange Fisher RX8s (the authors carve ski of choice (but only on non-powder days)). The yellow DPS’s are a VERY good ski; we recommend them. This goes without saying really. The fitter you are the longer you can ride. Turn 4 hrs into 6-7 hours; simple as that. Being fit is also important from a safety point of view. Let’s face it; you don’t want to be fatiguing half way down a technical decent, especially where a fall could have serious consequences. Before you go, make sure you’ve had an adequate amount of preparation. James Weir (aka The Ski Physio) runs ski fitness assessments and training at his Mosman Park Clinic. Other than that, we’ve used Jacobs Ladder in the past. Several weeks of Jacobs ladder combined with an appropriate amount of endurance training has done the trick for us in the past. 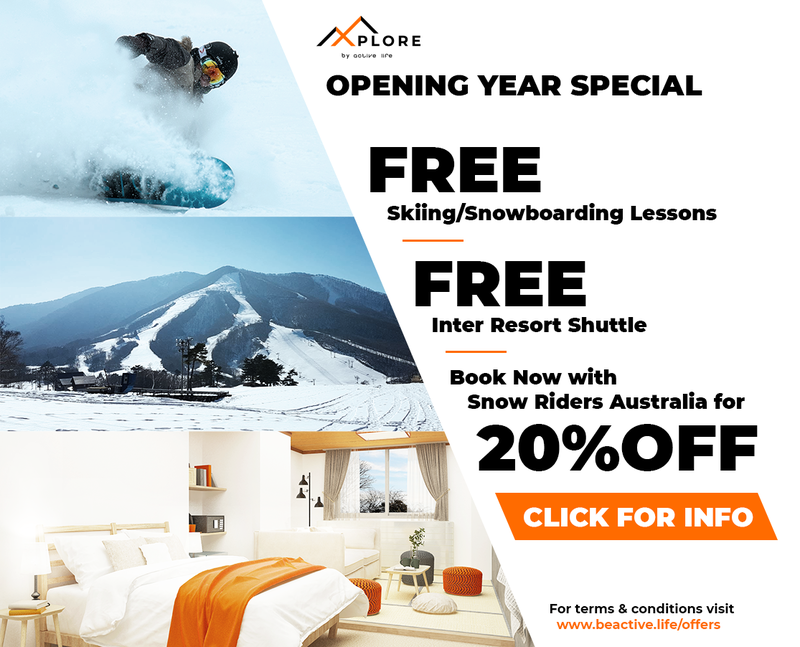 If you want to save money, book early and avoid the Chinese New Year period…Many resorts do early bird discounts and with many low costs carriers now flying to Japan, airfares are also now more affordable. For example, we paid only $1,060 for our flights even though we booked very late (mid September). Out of Perth, Cathay Pacific is our airline of choice. The Perth-Sapporo (New Chitose) flights are direct with only one stop-over (Hong Kong) and relatively short at just under 14 hrs in total. We’ve done 21 hour marathons (Perth-Singapore-Tokyo-Sapporo) with Qantas in the past for a lot more. So get in early and secure a good deal. Depending on how long you stay, accommodation amounts to either you greatest or second greatest cost. If you get in early enough, and stay away from the big commercial hotels, you can book a decent bed and breakfast from $85 to $110 a night. 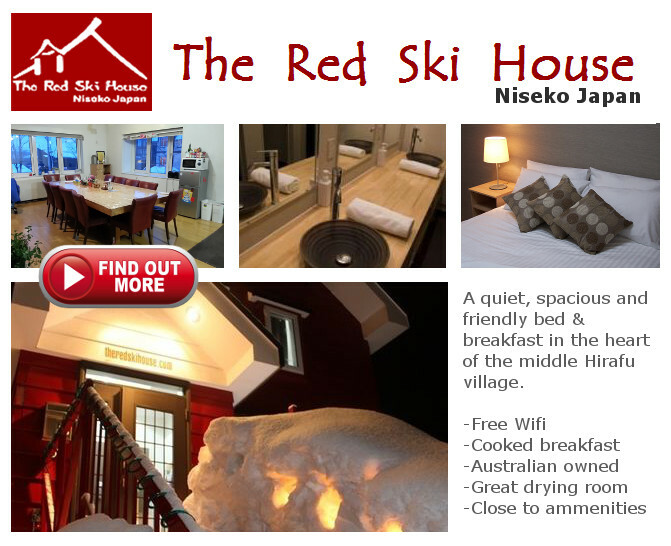 When in Niseko, we stay at the Red Ski House, a great little B&B in the heart of the Hirafu Village – we love it and keep going back. Comfortable, affordable, and non-pretentious. Image: The Red Ski House is a great little accommodation option for those who enjoy a communal atmosphere. Click on the image for more information. Of all the places to ride in the world, few offer conditions like Japan: deep powder, beautiful mountains, amazing culture and scrumptious local cuisine. However, Japan is not like other international ski resorts. While drunken shenanigans and loud obnoxious behaviour is tolerated in some overseas resorts, the resorts of Japan are certainly not in that group. So don’t be a bogan! Remember to cover up that southern cross tattoo and dress appropriately. Australian flags are not considered clothing. Pull your pants up. Don’t urinate in public and leave your drugs at home. Getting caught with a single joint in Japan can land you in jail for up to five years. Seriously! While credit cards are taken in some Japanese resorts, especially in some of the larger hotels, Japan is still pretty much a cash society. Carry yen with you at all times, especially when visiting smaller resorts and restaurants. Remember Japanese are very polite, and even the simple act of turning down a credit card transaction can be very embarrassing for them (their culture is always to oblige). If you run out, most of the largest resorts have Aussie friendly ATMs. While you won’t find a Commonwealth or ANZ ATM in downtown Niseko, you will find generic ATMs with the ‘cirrus’ symbol. Local currency can be taken directly out of these machines using your Aussie pin numbers. In fact, this reminds of us of a time we visited an ATM in downtown Niseko. When a drunken Aussie inquired very loudly: “why the f*ck don’t they have ANZ ATMs? ?”; we replied, “for the same reasons they don’t have beaches, and because we’re in Japan you dickhead“. At this point we reiterate our comments under our earlier ‘Japan is not Bali’ tip. It may come as a surprise to some that while UHF-CB and PRS radios are OK to use in Aussie resorts, they are strictly taboo in Japan. In fact, there are heavy fines and a possible jail sentence for those in breach of this law. Although yet to be verified, we have heard that UHF radios are banned because it interferes with the Japanese TV signal, which also uses the UHF frequency. Whatever the reason, if you have to use hand-held radios for communication, we recommend purchasing them in Japan. Otherwise you can purchase an inexpensive local SIM card for you phone, which tend to be better anyway as they are not restricted to line-of-site communication like some radios. The food is amazing in Japan! Why eat pizza and Mexican just because it’s available. Get out there and sample the local cuisine. This extends to not only the foods you are more familiar with, sushi, ramens, tempura etc., but the even the not so familiar: pickled veggies and savory egg custards. Having said this, Niseko is home to an eclectic collection of restaurants and food vans. If you have to stray, the food vans provide an excellent assortment of choices from Indian curries to American style hot-dogs. They are worth it for the ‘quirky’ factor alone, just not all the time. Glenn is an avid skiier from Perth, Western Australia. As a Melbourne ex-pat, Glenn grew up skiing the Victorian resorts of Falls Creek, Buller and Hotham, where in 1998 he worked as a dish-pig and pizza maker; jobs which he still describes as the best of his life, despite his current occupation as a marine biologist. In addition to skiing in New Zealand and Australia (and UAE! ), Glenn has recently spent a lot of time in Japan, where he now enjoys exploring the resorts of Hokkaido (big and small). Glenn founded Snowriders in April 2015 as a meeting point for skiiers and boarders and as a source of snow related information. He and his fellow directors, Andrew and Jim, continue this passion today.